"...while in line, a Japanese plane was flying directly overhead, so low in fact, that he felt that he could almost reach out and touch it. He thought it odd, and as it passed overhead, the gunner in the rear, waved merrily to the men on the ground..."
Image taken in 1941 at age of 22 in San Diego, CA. Web master Note: At the time of the writing of this story, Jacques was in ill health and slowly but steadily yielding to the inescapable conclusion of his life with us. That day came on August 5th, 2003 shortly after Jacques was moved to a local nursing home near his home in southwestern Louisiana. Ironically, his old girlfriend of his younger years happened to be in the same nursing home -- neither knowing of the other's presence. As you will read in the following story, Jacques had a passion in life -- above all else -- and that was to eat. It is fitting that on the day of his passing, he had just finished his favorite meal of the day, breakfast, when a nurses aide came into his room to find that he had dozed off and passed away with a smile on his face. Jacques is no longer with us...but his memory will forever be with those who cared deeply for him. Jacques -- let us hope that you are where you can still enjoy a full and bountiful breakfast each and every day. We will all miss you Jacques! This is a brief story of a very fine elderly gentleman who deserves some credit and recognition for a job he did many years ago and to this day has been denied what he has felt since back in 1941 at Pear Harbor -- his rightful due. The story you are about to read needs to be said and forever known as the events that Jacques experienced some 60 years ago. Jacques, you see, is now in failing health and has a number of ailments and diseases that will eventually lead to his leaving forever his loved ones. So this tale is being written by his son-in-law, Joe Richard, the webmaster of this site. Some ten years or so ago, I (his son-in-law) managed to get Jacques to relate to me a story that up until that time had only heard in whispers, bits and pieces and in general with much speculation. We were sitting one fine spring morning in the family living room on the farm in Acadia Parish, Louisiana visiting while drinking coffee and talking about the "war" and Jacques' yet to be revelations of the events that surrounded the morning of Sunday, December 7th, 1941, at Schofield Barracks/Wheeler Field on the island of Oahu, Territory of Hawaii. Additional information came to light last weekend when his daughter, Carol spent the weekend visiting with Jacques and along with a copy of the material as originally contained on this page, sat down and discussed in detail, the subject of Pearl Harbor Day with her Dad...for the first time ever. The discussion was a bit of an eye opener and at times Jacques had memory lapses. However, from this conversation with him, his wife and two of his daughters present, the following is transcribed from the notes taken during that discussion. We all knew of the fact that Jacques was there during the attack and subsequent head-over-heels hurdling into the global war by the up to this time neutral United States of America. However, Jacques always refused to talk about his experiences of that fateful day to which he became a witness to one of the most catastrophic events in American history. We had all heard of the nice and pleasant experiences that Jacques had lived during his years in the war. For Jacques enlisted into the Army early in 1941. He often talked of his many experiences regarding food -- Jacques loved (and still does love) to eat. He talks of his train trip across the country from Florida to California and except for the kindness of folks along the way, the new soldiers were only marginally fed. This fondness for food and the wonderful experience of eating could possibly have been a major factor in saving his life and that of his friend, Joseph Lanclos, on the morning of Sunday, December 7, 1941. 26 October 2002 -- New images from Jacques personal photo album from his days in Hawaii are now placed throughout this narrative. Jacques had another photo album with even better images of the aftermath of the attack on Pearl Harbor and the island defences. This album disappeared when my wife, his oldest daugter was a young child. It has never been seen since. "Jacques Fuselier entered the U. S. Army in 1940 and was trained as an anti-aircraft [gunner] specialist. He often joked at how he had wished he had paid more attention in class -- for he was trained not with the real thing; but, with guns made of wood! He mentions that the reason behind this was a shortage of weapons, many being diverted to the European theater of the "our yet to be entered into the war". He was later additionally trained as a heavy truck driver, for he had had driving experience for many years. His father owned and ran a small farm [some 40 acres or so] and he had learned how to drive farm equipment when a child (His eldest daughter -- the wife of this researcher, carried on the tradition also by learning at about the time her feet could reach the pedals). Few men coming out of the great depression of the 30's, serving at this time, had any driving experience...much less on heavy equipment. This would serve Jacques well later on during the war. When the draft was initiated, Jacques agreed to go into the service for the required one year of service and at which time, he and his brother, Levin, would in essence, "swap places" as he put it. Levin was the only other son and he was left at home to work the farm. When Jacques' year was about to expire, he had the opportunity to take an assignment in the tropical paradise of Hawaii, if he would accept another year's tour. So, out of the "kindness of heart", he accepted the extension -- thus allowing his brother the luxury of staying home on the farm and skipping the years service, while Jacques went off to see the Pacific and its' wonders. Jacques' big crutch in life was and is his ferocious appetite. He can eat any time, any place, and anything. This point is mentioned, for it quite probably saved his life. On Sunday, December 7, 1941, Jacques was stationed at Schofield Barracks, Hawaii and had been stationed there prior to the war (he arrived on 9 October 1941). Schofield Barracks was located near the center of the Hawaiian island of Oahu adjacent to Wheeler Field, the largest Army Air Corps Base in the Pacific. Jacques sporting his summer dress uniform. On Schofield Barracks, there was housing for a large number of soldiers, and there was additional housing in the form of "tent cities" located on the reservation as well as on and near Wheeler Field. It has not been established in my mind as to the exact location as to where Jacques was actually living...whether in the barracks or in the tent city. He has mentioned the "tent city" on a number of occasions. It is my understanding that because of the large contingent of servicemen there, the new arrivals were housed in the tent city and as time passed -- many ended up in the "barracks" proper. A build-up of troops was in progress because of heightened tensions with Japan. Every Sunday morning, while his buddies in the barracks(?) were catching extra z's, he and his best buddy, Joseph W. Lanclos [Note: See contents from Joseph W. Lanclos Letter ] -- currently of Arnaudville, Louisiana, would hurry over to the mess hall to be at the beginning of the line for a huge breakfast...his favorite meal of the day. This specific morning, Jacques and Joseph hurried to the large outdoor kitchen at Schofield Barracks, near the rifle range to partake of a breakfast consisting of flap jacks -- a favorite of both. Well, on that fateful morning while standing in that line, they heard in the distance the drone of a large number of planes and they noticed that large formations of planes were seen approaching the harbor and airfields...not unusual, but the numbers were larger than usually seen at any given time. They figured that something special was happening, maybe a new bigwig being posted to Pearl Harbor. While observing the formations of planes, the men noticed that the planes were apparently dropping something. Indeed they were... BOMBS and they began to explode all over the place, for this was the beginning of the 'day of infamy'...Pearl Harbor Day and America's rude entry into the conflict that will be forever remembered as World War II. Jacques recalls while in line, a Japanese plane was flying directly overhead, so low in fact, that he felt that he could almost reach out and touch it. He thought it odd, and as it passed overhead, the gunner in the rear, waved merrily to the men on the ground -- while at the same time, the pilot began firing at the massed soldiers gathered at Schofield Barracks. Jacques remembers the bullets hitting the asphalt and throwing up chunks of asphalt. As he watched, a second plane passed overhead also flying low. This plane dropped a bomb almost directly overhead with the forward momentum carrying the bomb some hundred yards or so and making a direct hit on one of the buildings, almost totally destroying the structure. Jacques in a casual pose. Prior to the attack, some three weeks or so previous, a large supply of World War I 30 caliber ammunition was brought to Schofield Barracks/Wheeler Field and stored in a large building there...the same building that was apparently hit by the bomb! Afterthought...it seems that the spies that Japan had living on the island had done their homework -- all too well. On a recent visit home(September 2002), Jacques was alert and in a very talkative mood. For a while we talked once more about some of the events on that fateful day in December 1941. He told me that as the planes came over and began firing on the troops massed for breakfast, the troops (understandably) began to run and scatter. As they began to run, Jacques distinctly recalls the banging and clanging of the troops mess kits (usually attached to their web belts while in line awaiting their turn) as they ran. Quite a racket they made, too. He thought that in the chaos, it was ironically funny listening to all of that banging and clanking. It is almost comical, someone recalls such small details such as this during times of extreme stress. As the attack was in progress, the bombs began to fall in earnest, the officers began shouting orders for everyone to head to the nearby rifle range to be issued firearms and ammunition. About this time, the men at Schofield could look down towards the harbor and view the terrible sight unfolding as the attacking planes began to wreak their havoc among the anchored ships in the harbor. They could see what appeared to be a "mist" or "fog" rising from the harbor area. Jacques did not elaborate on this (quite possibly results of the bombing). After the men were in the process of being armed, the men who were anti-aircraft trained, such as Jacques, were ordered to head to the mouth of the harbor to man the battery of anti-aircraft guns (3-inch) located there. The guns were situated in a "firing pit" of sorts that allowed for the weapon to rotate to follow attacking aircraft. Upon reaching this assignment, the men began firing on the attacking aircraft (it is assumed that at this time, the attack had entered into the second wave of aircraft). The weapons were fired and targets were plentiful, indeed. The firing was to the extent that the barrels became red hot and the guns began jamming. He exited the hole, and ran away from the anti-aircraft position being told by one of the officers present to return to his unit at Schofield/Wheeler (at this point, Jacques mentions returning to his outfit to assist them in clearing the runway area of debris to allow the few remaining aircraft (approximately three) to have a clear path to take-off. Touring some of the attack damage. Jacques was engaged in righting and removing a creosote laden barrel near the runway, when his feet slipped out from under him causing him to smash his jaw heavily onto the edge of the barrel -- breaking free two upper teeth. This same action, according to Jacques, quite possibly injured his back. Jacques goes on the say that "all hell had broken loose" all over the island and was pure chaos. This continued until about 3 P.M. that day. The chaos then became more organized chaos (if you can call it that) and at this point many men were detailed to help in recovery of wounded and in the recovery of the tremendous numbers of American dead -- on land and in the water. Jacques, as we mentioned earlier was trained as a heavy duty truck driver and recalls the sober task of recovering the dead. He was detailed to drive a truck used in this grizzly task -- thankful that he was not detailed to the task of actual recovery. Jacques at some point (it appears from his comments that this was the next day) was sent to the hospital/dispensary to have the jaw looked at. The doctor who attended to Jacques, happened to be a dentist. He applied some stitches to the "wound" and at some point about here in Jacques' story he was placed in the hospital/dispensary as an in-patient for "three days". The same doctor, later told Jacques that he was a dentist and while in the hospital, built him two new stainless steel crowns -- thus replacing the teeth which had been knocked out in the accident. Jacques recalls the date of this dental work as being the 8th of December. Jacques also mentions recalling the nationality of the attending doctor: he was Japanese-American! Why was Jacques placed in the hospital/dispensary for a three day period? Is it possible that this was due to the fact that he complained of a hurt back and he was there for observation and tests? We are not certain at this point. A check of his recently received military medical records indicate nothing in his records in Hawaii until some months later. During this time period and the preceding months in Hawaii, Jacques was discovered to have contracted a case of TB (tuberculosis). This was discovered during one of his stays in the hospital during his tour in Hawaii. He had gone into the hospital after injuring his back on at least two occasions as mentioned in his medical records. The records also mention the point that 'he originally injured his back at age 12  when he fell some 8 feet to the ground from a tree, and landing on his bottom'. The induction physical he took when entering the service makes NO mention of such an injury. His family also was aware of NO such mention of an injury until the released medical records came to light. Jacques, later on, following these events was designated as a driver for the chaplain of the 53rd Brigade at Ft. Shafter. This was his first military chauffeur job. He later tells of how he was designated as the driver to a "one star general" who took him along to one of the islands after it was invaded and taken from the Japanese. He did not elaborate as to all of the details, except that the island was usually "secure" when this happened. Jacques medical records give a history of some of his service and mentions that the majority of his 35 months service in Hawaii was spent as a "staff car driver". Jacques was eventually placed in the hospital with a case of TB and during October or November of 1944 he was flown back stateside for additional treatment. On the long flight from Hawaii, Jacques remembers being in a bed aboard the plane, directly over another soldier -- who was being sent home for severe burns over most of his body. He recalls how severely the man was burned and the sad sight of him during the long overwater trip. He arrived in California and was isolated for a week in quarantine while undergoing testing. He recalls that after being released from quarantine, he spent a night at some hotel in southern California before being shipped off to Sante Fe, New Mexico for further treatment of his case of TB. He eventually was kept in treatment in the military until his release from active service in March of 1945. When the family of Jacques Fuselier requested the military medical records, the records arrived some months later (2000) and the early medical records from his first months in Hawaii are nonexistent. Why? I, for one would love to know. They appear to start after the first few months of 1942 and only briefly at that. I for one would welcome any and all input from his fellow servicemen who also would have been stationed at Schofield Barracks/Wheeler Field on the morning of December 7, 1941 -- for I along with other family members would love to hear from someone who might have had a similar experience at Schofield Barracks that morning almost 60 years ago." Additional notes on 26 June 2002. It has always been the contention of Jacques Fuselier that he was injured during the attack on Pearl Harbor on December 7, 1941. Jacques has lived with these memories all of his life and has spent most of his life afterwards coming to grips with the military, the Office of Veterans Affairs, and attempting to set the records straight -- all to no avail. The VA (and military) in their infinite wisdom has never done right by Jacques especially as his age began to fail and he became ill with the numerous ailments that are slowly and inexorably eating away at his last vestiges of life -- cancer, runaway diabetes, strokes, heart attacks to mention a few. Jacques and his family have attempted to get the military to acknowledge that he was indeed injured on the day of the Japanese attack on the Hawaii islands and subsequently received a Purple Heart for those injuries. This in turn would have allowed him to be able to try and get additional benefits to assist in his medical treatment -- has been ongoing for a number of years now. Jacques is losing the fight. He is bed ridden, having to depend totally on others for his daily care and well being. Just a few days ago, his wife received a letter from the VA telling them that they (the VA) have again reviewed his case and deny any additional benefits. Case closed. As a young child, the wife of this writer and web master vividly recalls playing with the campaign ribbons that Jacques had brought home -- doing so while playing with her dolls. She also recalls playing with a very special medal and ribbon -- for it was heavy, in the shape of a heart with a man's head imprinted on it. The attached ribbon as well as the heart shaped medal itself was also in her favorite color -- purple! I do believe that there are not too many awards given out by the American military that match this description -- but one: the Purple Heart. This medal along with other memorabilia were kept from Jacques family by his sister and has vanished since her death some years ago. My wife, Jacques' eldest daughter recalls this special item, and also recalls that after playing with it as a child, it was never seen again by family members other than the sister of Jacques. When reviewing the discharge papers with Jacques some time back, and looking over the citations -- I noted that absence of the Purple Heart on the "official records" and questioned Jacques about this. He responded that when he was being discharged, the lady typing the papers was being overseen by an Army officer who TOLD HER what to type -- end of story. Jacques many years ago told me his story of the events of December 7, 1941 and many of the details differ sharply from the events depicted in the above narrative. The official version above is from conversations taken over a period of time and in conjunction with the so called "official medical records" that were eventually received through intervention by my U. S. Senator. Jacques, like so many other veterans, has been a very bitter man for most of his life -- which is directly related to the events of Pearl Harbor and what followed. He spent the better part of three and a half years in and out of hospitals during his military career. He was suffering from a broken back as well as tuberculosis which was detected during one of his many hospital stays. He has contended all of his life that the military has done him wrong. His family agrees. Image of downed Japanese fighter/bomber. Official Images taken of the same Zero -- AI-154 piloted by NAP1/c Takeshi Hirano. 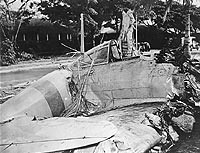 Japanese Type 00 Carrier Fighter ("Zero") that crashed at Fort Kamehameha, near Pearl Harbor, during the attack. This plane, which had tail code "A1-154" and a red band around its rear fuselage, came from the aircraft carrier Akagi. 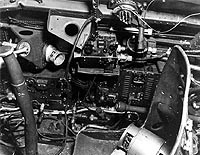 Interior of the cockpit of a "Zero" which crashed into Building 52 at Fort Kamehameha, Oahu, during the 7 December 1941 raid on Pearl Harbor. The pilot, who was killed, was NAP1/c Takeshi Hirano. Plane's tail code was "AI-154". Note the U.S. manufactured Fairchild Radio Compass in the upper center (Compass Model RC-4, Serial # 484). It was tuned in on 760 KC. -- Joseph L. Richard, Son in law of Jacques Fuselier. Jacques Fuselier was born in 1919, in Eunice, St. Landry Parish, Louisiana to Thoegen Fuselier and Marie Louise Fournerat. He was married in 1946, shortly after the war ended to Ollie MANUEL (who is the subject of another short tale in this section) of Eunice, St. Landry Parish. Jacques was the youngest son in a family of one girl and two boys. He has spent all of his life in the Eunice/Basile area living and working the family farm and as a carpenter -- living a tough, but rewarding farm lifestyle. Jacques and Ollie raised a family of three fine young southern ladies who today are making their mark on the world. One daughter is a school principle, a second is a nurse of 34+ years experience and the third is a successful homemaker and mother of three. one's story? We have made it very easy for you to do so. set up to conviently record your story.